We stock various food items, cosmetics, fresh fruits and vegetables, household essentials, furniture, apparel and much more. Our well-trained and friendly staff are here to help you find what you need. If we don't have it, let us know and we will stock it for you. Why? Because we loveour customers and want them to be happy...always! 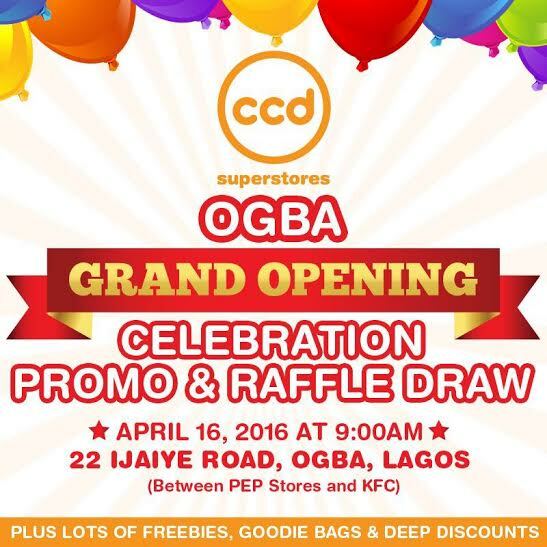 The first 50 customers to spend N5, 000 on the 16th of April will get a bag filled with free goodies. 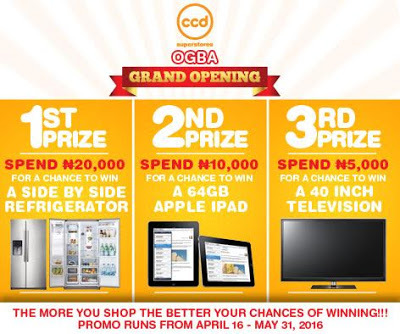 There are lots of other great prizes to be won from a double door fridge to aniPad and a 40 inch TV. The more you shop, the better your chances of winning. 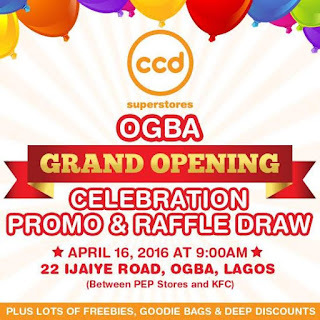 So make sure you visit us at CCD Superstores, Your one stop neighbourhood storeproviding quality products at affordable prices, from this Saturday, April 16, 2016,at 22, Ijaiye Road, Ogba, Ikeja, Lagos.